Egypt’s impact on later cultures was immense. You could say that Egypt provided the building blocks for Greek and Roman culture, and, through them, influenced all of the Western tradition. Today, Egyptian imagery, concepts, and perspectives are found everywhere; you will find them in architectural forms, on money, and in our day to day lives. Many cosmetic surgeons, for example, use the silhouette of Queen Nefertiti (whose name means “the beautiful one has come”) in their advertisements. Ancient Egyptian civilization lasted for more than 3000 years and showed an incredible amount of continuity. That is more than 15 times the age of the United States, and consider how often our culture shifts; less than 10 years ago, there was no Facebook, Twitter, or Youtube. While today we consider the Greco-Roman period to be in the distant past, it should be noted that Cleopatra VII’s reign (which ended in 30 B.C.E.) is closer to our own time than it was to that of the construction of the pyramids of Giza. It took humans nearly 4000 years to build something–anything–taller than the Great Pyramids. Contrast that span to the modern era; we get excited when a record lasts longer than a decade. Egypt’s stability is in stark contrast to the Ancient Near East of the same period, which endured an overlapping series of cultures and upheavals with amazing regularity. 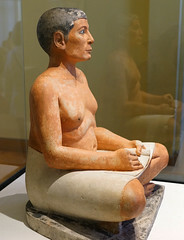 The earliest royal monuments, such as the Narmer Palette carved around 3100 B.C.E., display identical royal costumes and poses as those seen on later rulers, even Ptolemaic kings on their temples 3000 years later. A vast amount of Egyptian imagery, especially royal imagery that was governed by decorum (a sense of what was ‘appropriate’), remained stupefyingly consistent throughout its history. This is why, especially to the untrained eye, their art appears extremely static—and in terms of symbols, gestures, and the way the body is rendered, it was. It was intentional. The Egyptians were aware of their consistency, which they viewed as stability, divine balance, and clear evidence of the correctness of their culture. This consistency was closely related to a fundamental belief that depictions had an impact beyond the image itself—tomb scenes of the deceased receiving food, or temple scenes of the king performing perfect rituals for the gods—were functionally causing those things to occur in the divine realm. If the image of the bread loaf was omitted from the deceased’s table, they had no bread in the Afterlife; if the king was depicted with the incorrect ritual implement, the ritual was incorrect and this could have dire consequences. This belief led to an active resistance to change in codified depictions. The earliest recorded tourist graffiti on the planet came from a visitor from the time of Ramses II who left their appreciative mark at the already 1300-year-old site of the Step Pyramid at Saqqara, the earliest of the massive royal stone monuments. They were understandably impressed by the works of their ancestors and endeavored to continue that ancient legacy. Egypt is a land of duality and cycles, both in topography and culture. 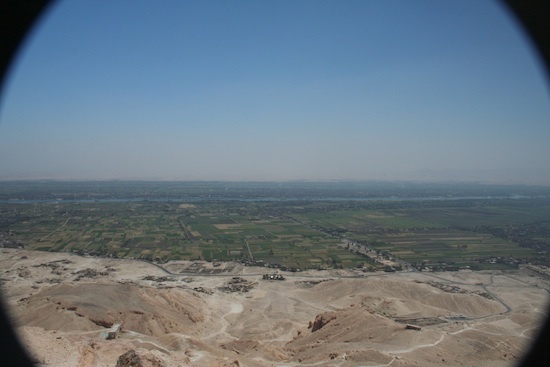 The geography is almost entirely rugged, barren desert, except for an explosion of green that straddles either side of the Nile as it flows the length of the country. The river emerges from far to the south, deep in Africa, and empties into the Mediterranean sea in the north after spreading from a single channel into a fan-shaped system, known as a delta, at its northernmost section. The influence of this river on Egyptian culture and development cannot be overstated—without its presence, the civilization would have been entirely different. The Nile provided not only a constant source of life-giving water, but created the fertile lands that fed the growth of this unique (and uniquely resilient) culture. Each year, fed by melting snows in the far-off headlands, the river overflowed its banks in an annual flood that covered the ground with a rich, black silt and produced incredibly fertile fields. The Egyptians referred to this as Kemet, the “black lands,” and contrasted this dense, dark soil against the Deshret, the “red lands” of the sterile desert; the line between these zones was (and in most cases still is) a literal line. The visual effect is stark, appearing almost artificial in its precision. The annual inundation of the Nile was also a reliable, and measurable, cycle that helped form their concept of the passage of time. In fact, the calendar we use today is derived from one developed by the ancient Egyptians. They divided the year into 3 seasons: akhet “inundation,” peret “growing/emergence.” and shemw “harvest.” Each season was, in turn, divided into four 30-day months. Although this annual cycle, paired with the daily solar cycle that is so evident in the desert, led to a powerful drive to see the universe in cyclical time, this idea existed simultaneously with the reality of linear time. These two concepts—the cyclical and the linear—came to be associated with two of their primary deities: Osiris, the eternal lord of the dead, and Re, the sun god who was reborn with each dawn. 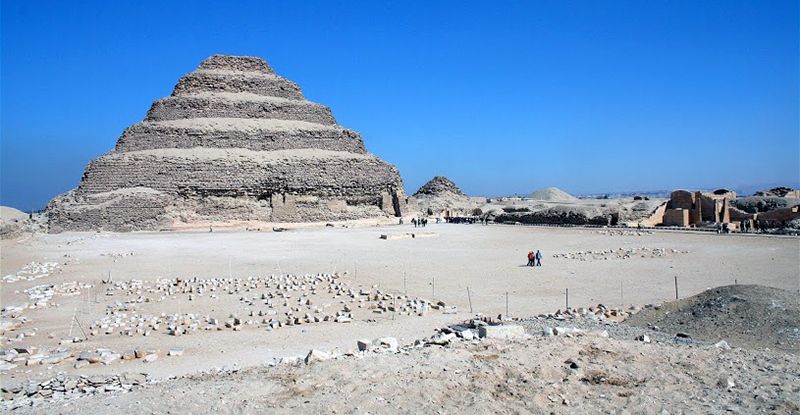 The civilization of Egypt obviously did not spring fully formed from the Nile mud; although the massive pyramids at Giza may appear to the uninitiated to have appeared out of nowhere, they were founded on thousands of years of cultural and technological development and experimentation. “Dynastic” Egypt—sometimes referred to as “Pharaonic” (after “pharaoh,” the Greek title of the Egyptian kings derived from the Egyptian title per aA, “Great House”) which was the time when the country was largely unified under a single ruler, begins around 3100 B.C.E. The period before this, lasting from about 5000 B.C.E. until unification, is referred to as Predynastic by modern scholars. Prior to this were thriving Paleolithic and Neolithic groups, stretching back hundreds of thousands of years, descended from northward migrating homo erectus who settled along the Nile Valley. During the Predynastic period, ceramics, figurines, mace heads, and other artifacts such as slate palettes used for grinding pigments, begin to appear, as does imagery that will become iconic during the Pharaonic era—we can see the first hints of what is to come. It is important to recognize that the dynastic divisions modern scholars use were not used by the ancients themselves. These divisions were created in the first Western-style history of Egypt, written by an Egyptian priest named Manetho in the 3rd century B.C.E. Each of the 33 dynasties included a series of rulers usually related by kinship or the location of their seat of power. Egyptian history is also divided into larger chunks, known as “kingdoms” and “periods,” to distinguish times of strength and unity from those of change, foreign rule, or disunity. The Egyptians themselves referred to their history in relation to the ruler of the time. Years were generally recorded as the regnal dates (from the Latin regnum, meaning kingdom or rule) of the ruling king, so that with each new reign, the numbers began anew. Later kings recorded the names of their predecessors in vast “king-lists” on the walls of their temples and depicted themselves offering to the rulers who came before them—one of the best known examples is in the temple of Seti I at Abydos. 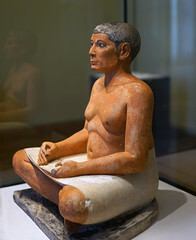 These lists were often condensed, with some rulers (such as the contentious and disruptive Akhenaten) and even entire dynasties omitted from the record; they are not truly history, rather they are a form of ancestor worship, a celebration of the consistency of kingship of which the current ruler was a part. Kings in Egypt were complex intermediaries that straddled the terrestrial and divine realms. They were, obviously, living humans, but upon accession to the throne, they also embodied the eternal office of kingship itself. The ka, or spirit, of kingship was often depicted as a separate entity standing behind the human ruler. This divine aspect of the office of kingship was what gave authority to the human ruler. The living king was associated with the god Horus, the powerful, virile falcon-headed god who was believed to bestow the throne to the first human king. Horus’s immensely important father, Osiris, was the lord of the underworld. One of the original divine rulers of Egypt, this deity embodied the promise of regeneration. Cruelly murdered by his brother Seth, the god of the chaotic desert, Osiris was revived through the potent magic of his wife Isis. Through her knowledge and skill, Osiris was able to sire the miraculous Horus, who avenged his father and threw his criminal uncle off the throne to take his rightful place. Osiris became ruler of the realm of the dead, the eternal source of regeneration in the Afterlife. Deceased kings were identified with this god, creating a cycle where the dead king fused with the divine king of the dead and his successor “defeated” death to take his place on the throne as Horus. Cite this page as: Dr. Amy Calvert, "Ancient Egypt, an introduction," in Smarthistory, August 8, 2015, accessed April 22, 2019, https://smarthistory.org/ancient-egypt-an-introduction/.